Dioxins are they found just about everywhere. They are present in the atmosphere, soil, rivers and the food chain. They come from waste incinerators and chemical and fertiliser manufacturing plants mainly. The introduction of a new chlorine production technique in 1900 means they have become more widespread. However, volcanoes and forest fires also produce dioxins. In living organisms, toxins reside in fat. This means they can persist in the food chain through a process called bioaccumulation. They are mainly found in meat and dairy produce, but are also found in poultry, fish and on unwashed fruit and vegetables. Fish accumulate dioxins through exposure to water. Dioxins are repelled by the water and attach themselves to the fatty fish Unless - as was the case in Belgium - feed becomes contaminated, animals are usually exposed to dioxins in the air settling on their food. Environmental campaign groups describe them as among the most dangerous toxins known. Scientists are working to establish their exact toxicity, but a draft report from the US Environmental Protection Agency indicates dioxins are considered a serious threat to public health. 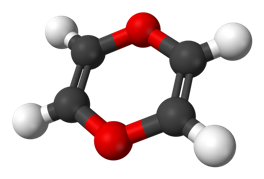 In 1997, a World Health Organisation group declared the most toxic dioxin - 2,3,7,8-tetrachlorodibenzo-p-dioxin, or TCDD - a class 1 carcinogen, meaning it causes cancer in humans. The first disease associated with dioxins was the extreme skin disease chloracne. It causes acne like pustules to form across the body and can last for several years. Most concerns now lie with the potential of dioxins to cause cancer, but they are also suspected of affecting reproductive health, lowering sperm counts, causing behavioural problems and increasing the incidence of diabetes. There is a growing body of research indicating that dioxins can cause such diseases. In particular, a peer-reviewed study of the population of Seveso found that, in the 10 years following the explosion, both men and women more likely to have cancer. It looked at people who lived in an area some distance form the plant that was not evacuated. Both sexes were more likely to have cancers of the blood system, while women were also more likely to have cancer of the gall bladder and liver system. In 1990 the WHO set a safe daily exposure level of 10 picogrammes per kilogram of body weight. A picogramme is one millionth of a millionth of a gram. However, following further studies this was re-evaluated in 1998 to one to four picogrammes per day. Pressure from environmental lobbyists has led to companies changing their practice and a reduction in dioxin emissions. Campaigners continue to press for tighter controls.